Hit the snooze button (at least three times). Lie there and think about how much you don’t want to get up. Or moan and groan about how much you hate your job. Run out the door with a honey bun (or nothing) in your hand. With so many people starting their day off like this, it’s no wonder there’s constant grumbling in the mornings. How can anyone expect to have a great day when their morning routine is rushed and filled with negative thinking? Getting the day off on the wrong foot can sabotage your entire to-do list and prevent you from making progress on your goals. But what if you could change your life simply by developing an inspiring morning routine that sets you up for success? 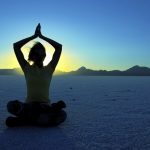 About a year ago, I started to create my own morning practice that included healthy habits and positive thinking. As I began to follow this routine more and more, I noticed that not only was I feeling better mentally and physically, but that I was also able to focus on my goals and get more done throughout the day. 1. Wake up one hour earlier. I don’t consider myself an early riser, but I do feel more inspired to get things done when I wake up before 8:00am. Set your alarm to go off an hour earlier than usual as you’ll need extra time to accommodate your new morning routine. Of course, going to bed earlier makes this task easier! 2. Get up immediately. Avoid lying there and thinking negatively about your day, life, job, challenges or anything else. Instead, get your head up off the pillow quickly before you convince yourself that five more minutes won’t hurt. It helps to place your alarm clock or phone on the other side of the room. That way, you’re actually forced to get up to turn it off. 3. Drink an 8-16 oz. glass of warm water with lemon. Or leave a bottle of water on your nightstand if that’s more convenient. Just be sure to get your water in as soon as you wake. You’ll feel less groggy and ready to get moving! Plus, it’s much easier to continue the act of drinking water throughout the day when you get a head start first thing in the morning. 4. Meditate or pray. Take 5-10 minutes to meditate or pray. Being still or spending time in worship will put you in the right mindset to face the day. My simple meditation process includes reading the daily passage from Mark Nepo’s The Book of Awakening, then sitting in silence on my yoga mat by the window. 5. Prepare a healthy breakfast. It’s hard to focus on your goals when you miss the most important meal of the day! Try a quick, nutritious meal each morning, Some of my favorite “ready in 10 minutes or less” breakfasts include: fruit smoothies, oatmeal with bananas and almond butter, scrambled eggs with sauteed kale or Greek yogurt topped with fresh fruit and granola. 6. Exercise for at least 15 minutes. Take a walk, jump on the treadmill, do a full workout in the gym, etc. It doesn’t matter what kind of exercise you do as long as you get your body moving! I’m not a big fan of the gym, but I enjoy taking walks in the morning as the whole world seems to wake up with the sun, especially the birds! 7. Shower and put on something that makes you feel good. Take a hot shower or warm bath after exercising. Choose one of your favorite outfits or wear a beloved piece of jewelry. For instance, I often wear a gold ring with a small rose engraved on it because it was a gift from my grandmother. Whenever I put on that particular ring, I feel her love and encouragement throughout the day. This week, try to develop a morning routine that will help you to stay positive and focused. The practice outlined above will likely take you at least 60 minutes to complete. If that’s longer than you can spend, simply come up with an abbreviated version that works for you. For me, putting in the effort to develop an intentional morning routine has definitely had a significant impact on my productivity. Give it a try and see how it changes your day! Leave a comment below: Do you have a morning routine? Which activities help to put you into a positive and productive frame of mind for the day?